Here's another look at sweet SMOKEY, there's no sound but you can see he can walk and wants to feel safe again 😭! SMOKEY was surrendered at 14 because his owners wanted him euthanized. Instead of taking him to a Vet he is sitting alone in a kennel not able to hear or walk around and he deserves so much better. Please SHARE so he doesn't have to stay one minute longer feeling like he was thrown away and worthless. A FOSTER and RESCUE or Adopter would save him. Thanks! 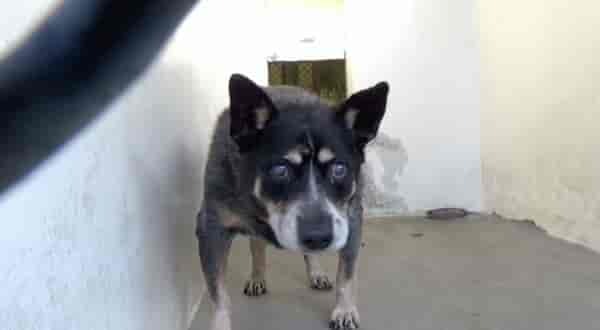 #A5132852 My name is SMOKIE and I'm an approximately 14 year old male Aus. Cattle Dog. I am not yet neutered. I have been at the Carson Animal Care Center since 11/26. I will be available on 11/26. You can visit me at my temporary home at C140. My former family who owned me for had to give me up because But they said that. 2 Responses to "SMOKEY was surrendered at 14 because his owners wanted him euthanized"
Smokie is safe! I was able to get him out yesterday with the help of 2nd Chances Rescue from Norco, CA! You can see new photos and video of him at home on Instagram @ghost_on_a_couch and can donate to his continuing care on gofundme.